Note: This page is generally only updated once a week: on Monday mornings. Some events have been covered in the news section of this website rather than here. October 30, 2017. 12:30 p.m. Phone bank – GET OUT THE VOTE NO ON PROP 1 CONSTITUTIONAL CONVENTION VOTE! 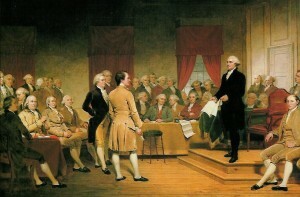 A New York Constitutional Convention? October 11, 2017. 6:00 p.m.
October 3, 2017. 6:00 pm. September 26, 2017. 6:30 p.m.
September 25, 2017. 6:30 p.m. to 8:00 p.m. Constitutional Convention — Yea or Nay? September 25, 2017. 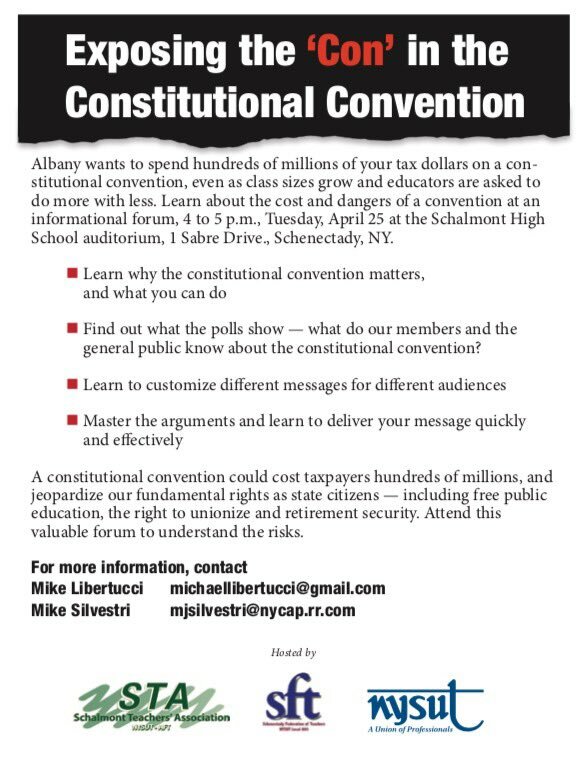 6:00 p.m.
NY Constitutional Convention: Salute to democracy or a big con job? Note: This is a live webcast. September 18, 2017. 7 p.m.
September 6, 2017. 12 p.m. – 2 p.m.
Co-sponsored by the Gertrude & Morrison Parker West Side Republican Club. September 5, 2017. 7:00 pm. A Constitutional Convention for New York – Yes or No? Co-hosted by Citizen’s Union, The Committee for Constitutional Convention, Forward March New York, and the New Kings Democrats. July 10, 2017. 6:30 p.m.
Should Progressive New Yorkers Support a State Constitutional Convention? May 2, 2017, 8 a.m.
April 18, 2017, 2 p.m.
April 18, 2017, 6:30 p.m. – 8:30 p.m.
A Constitutional Convention In New York State? March 13, 2017, 7:00 p.m to 9:00 p.m. The discussion is organized by the LWV of White Plains and co-sponsored by the local Leagues of Harrison, Larchmont/Mamaroneck, New Castle, New Rochelle, Northeast, Scarsdale and the Westchester county league. February 7, 2017, 7:00 – 9:00 p.m.
January 21, 2017, 10:30 a.m.
December 7, 2016, 6:30-8:00 p.m. Note: The session on New York State constitutional history was organized as a follow-up to the September 24, 2015 event described below organized by The New York State Constitutional Convention Clearinghouse. October 20, 2016, 6:00 p.m.
Can a NYS Constitutional Convention Strengthen Government Ethics? Background: See Gotham Gazette article, Preparing for New York’s Next Constitutional Convention Referendum, June 4, 2015, and New York History Blog article, November 29, 2015. The conference led to the public forum, The New York State Constitutional Convention in Historical Perspective, at The New York State Historical Association’s Conference on New York State History. See the event description above for November 17, 2016. June 16, 2015, 1:00-4:00 pm. Sat Oct 14th CDALF Labor Walk Saratoga and Malta, Malta Community Center 10:00 am. Sun Oct 15th PEF Region 8 Labor Walk, Clifton Commons, located at 14-22 Clifton Common Blvd, Clifton Park, NY 12065 From 2-5 P.M. Sat Oct 21th CDALF Labor Walk Schenectady and Rotterdam IUE/CWA 301 @336 Broadway 10:00 am. Sat Nov 4th CDALF Labor Walk Albany, Albany Public Teachers Assoc. 10:00 am. Thu Oct 12th Phone Banking CDALF Office 302 Centre Drive, Albany, NY 12203 from 5:00-8:00 pm. Thu Oct 19th Phone Banking CDALF Office 302 Centre Drive, Albany, NY 12203 from 5:00-8:00 pm. Thu Oct 26th Phone Banking CDALF Office 302 Centre Drive, Albany, NY 12203 from 5:00-8:00 pm. Tue Oct 31st Phone Banking PEF HQ from 5:00-8:00 pm. Wed Nov 1st Phone Banking PEF HQ from 5:00-8:00 pm. Thu Nov 2nd Phone Banking CDALF Office 302 Centre Drive, Albany, NY 12203 from 5:00-8:00 pm. Fri Nov 3rd Phone Banking PEF HQ from 5:00-8:00 pm. Mon Nov 6th Phone Banking PEF HQ from 5:00-8:00 pm. Tue Oct 17th Booth/Table ESP by McDonalds 11:00 am -1:00 pm. Wed Nov 1st Booth/Table ESP by McDonalds 11:00 am – 1:00 pm. Mondays and Fridays from 3:00 to 8:00pm @ Hell’s Kitchen Location to be disclosed with your RSVP confirmation. Tuesdays, Wednesdays and Thursdays from 3:00pm to 7:00pm @ Gramercy Park Location to be disclosed with your RSVP confirmation. Saturday and Sundays from 1:00pm to 5:00pm @ Various Manhattan Locations, to be disclosed with your RSVP confirmation.